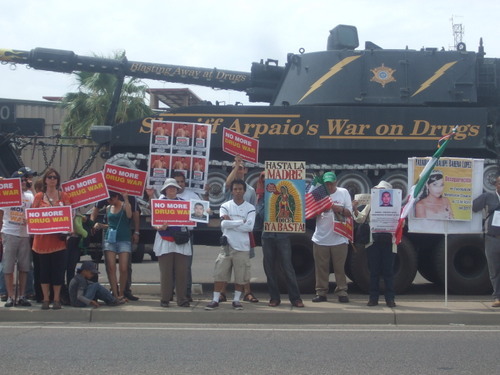 TUCSON, Arizona, Aug 18 2012 (IPS) - Fear stalks the streets in the U.S. state of Arizona. Seven-year-old Matthew feels it when his mother crosses the line permitted by the guards of the Tent City – an extension of the Maricopa County Jail – to be photographed with a sign protesting the imprisonment of immigrants. “No, no, no,” the little boy says, with a look of panic on his face. But then he goes quiet, refusing to answer any questions. “He’s scared. That is what all of us feel here,” his mother, Estela Jiménez, a U.S. citizen who lives in California, tells IPS. Jiménez, who has been in San Diego for 23 years and works at a shelter for deported migrants in the Mexican border city of Mexicali, was taking part in a protest in front of the Maricopa County Jail in Phoenix, Arizona on Thursday Aug. 16. The protest was held by members of the Mexican Movement for Peace with Justice and Dignity, headed by Mexican poet Javier Sicilia, along with minority rights activists from the United States. Sicilia is leading a caravan that is weaving its way along the southern border of the United States. The convoy is made up of family members of victims of the spiralling violence in Mexico triggered by conservative President Felipe Calderón’s militarisation of the war on drugs. The activists are demanding that the government of Barack Obama put an end to the heavy flow of smuggled firearms across the border into Mexico, and are calling for a new approach to the fight against drugs. The caravan set out on Aug. 12 from San Diego and plans to reach Washington D.C. on Sept. 10, after a journey of 9,400 km. The convoy of buses, campers and trailers is now in Arizona, a state of 6.5 million people where there are an estimated 460,000 undocumented immigrants, who are facing the country’s most draconian anti-immigrant laws. The legislation requires police to check the status of anyone they suspect is not in the country legally, and makes it a criminal offence for undocumented immigrants to work or look for work in the state. The controversial law, SB1070, which was enacted in 2010, was partially struck down by the Supreme Court in June. The racism in Arizona is especially strong in Maricopa County, where Phoenix is located. And it is epitomised by Sheriff Joe Arpaio, a dogged pursuer of undocumented immigrants and the inventor of the Tent City, where inmates are held in tents in summer temperatures that hit 50 degrees C in the shade. In Tent City, the prisoners are required to wear the black-and-white striped uniforms of old Hollywood movies, and pink underwear. They work in old-fashioned chain gangs, cleaning streets or painting walls, padlocked together by the ankle. And Arpaio had a huge “vacancy” sign installed at the top of the observation tower. Tent City was set up for people charged with misdemeanours, and most of the inmates are immigrants. Activists say there is a “new kind of apartheid” in Maricopa County. They say that although 38 percent of the 3.5 million people in the county are Latino, mainly Mexican, political control is completely in the hands of non-Hispanic whites. Arpaio, 77, of Italian descent, is seeking re-election this year to a fifth consecutive term as sheriff, riding high on the fight against illegal immigration. Jiménez, like Mercedes Moreno and Micaela Saucedo from the Casa de Refugio Elvira shelter in the Mexican border city of Tijuana, joined the caravan’s protest on Thursday, holding up their open passports. “We came to show Arpaio that we are as much U.S. citizens as he is,” Moreno said, showing IPS a photo of her son José Leonidas, who went missing in 1991 in Ciudad Hidalgo in the southern Mexican state of Chiapas, when he started the journey across Mexico to reach the United States. The protest outside the Maricopa County Jail was not on the caravan’s original schedule. The tension among the organisers, who were worried that one of the participants might be arrested, was plain to see. “Arpaio is capable of doing that,” Carlos García, who has been living in the county for 26 years, told IPS. Puente Arizona, and has been arrested several times for protesting the state’s immigration laws. But Arpaio did not have anyone arrested. On the contrary, he met with Sicilia and a group of activists who made a surprise visit to his offices in the Wells Fargo bank building. Before the meeting, which lasted one hour and became tense at times, the sheriff made sure the local press showed up. “I am not going to make you change your mind, but I am asking you for more humane treatment for our migrants,” the poet told him. The sheriff did not answer. Of an estimated 11 million undocumented immigrants in this country of 311 million people, 70 percent are of Latin American origin. The Obama administration has deported over one million immigrants so far. According to Border Angels, a non-profit organisation that provides water stations and other humanitarian aid to prevent deaths among people crossing rugged desert terrain, 10,000 people have died crossing the border from Mexico since 1994. The activist did not participate in the protests when the caravan came through, because his organisation is taking part in Boycott Arizona, a broad campaign against the state’s immigration laws. The peace movement led by Sicilia emerged in Mexico after the murder of his son Juan Francisco in March 2011. The convoy heading to Washington is the third caravan held by the movement to draw attention to the drug-related violence and demand justice for the victims. The contrast between the first two states it journeyed through was enormous. And Mexican-born City Councilmember José Huízar introduced a resolution recognising the caravan for its work. You don’t need to go to Afghanistan or Iraq to see human tragedy, all you have to do is look across our southern border, the councilman said, adding that his family had also suffered from violence in the Mexican state of Zacatecas. In California, which already has some of the toughest gun control laws in the nation, lawmakers are pushing for bills that would slow down the process of reloading an assault weapon and would require dealers to report purchases of large quantities of ammunition. But in Arizona, the caravan arrived the day Governor Jan Brewer issued an executive order instructing state agencies to deny driver’s licenses and identification cards to young undocumented immigrants applying for “deferred action”. Under the Deferred Action for Childhood Arrivals programme announced by Obama in June, young undocumented immigrants who came to the United States as children are potentially eligible for legal authorisation to work and study, and for a two-year deferral from deportation. The young immigrants, dubbed “dreamers”, are demanding full rights. But in Arizona, they cannot even take ethnic studies classes, which were banned in public schools in 2011. But church congregations, which are opposed to the growing racism and segregation in the state, welcomed the caravan with enthusiasm and warmth. “Let’s not be afraid, because fear is paralysing. And what they are going to ruin is the future of our kids,” said Jonathan Peck, holding his young son in his arms.